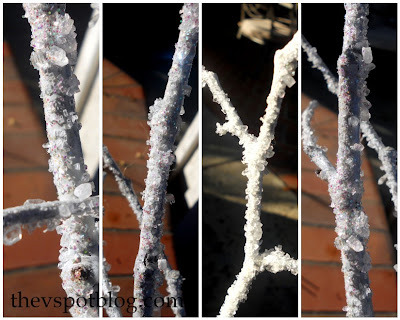 Today I’m sharing a quick and easy way to turn ordinary sticks and branches into frosted, icy ones for the holidays. I love the pretty, frosty branches, floral picks and other accessories that are available this time of year. However, they can be pretty darn pricey and I see no reason to pay for something that I can easily make myself for just pennies. 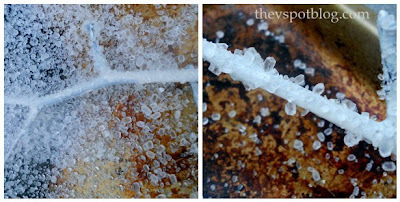 When getting the salt be sure to use epsom, which looks like icy little crystals, as opposed to rock salt, which looks like, well… rocks. I do this over the cookie sheet so I can reuse the salt that doesn’t stick. There are so many uses for them. They look great alone in a vase, or with smaller ones tucked into your Christmas tree or used in a wreath… The only caveat: salt melts if it gets wet… so this is NOT a good option for use outdoors. I need to find some branches this week! Thanks for showing me what to do next! These will look fantastic in a centerpiece! Epsom salt is totally magic. Holy yowza. Great idea! I am going to do this too. I found out that Epsom salt turns to powder in heat. The Valentine’s day candles I made last year didn’t survive the heat of my attic. I will so be doing this project, there’s nothing like adding a little glitz and glam to Christmas! So awesome! Going to collect some good branches later this week. This is one project I can do. I’m so going to have to do this! They look great! So wonderful. You are brilliant and so are these. WOW that’s fabulous – and the big old oak trees on our hill are ALWAYS dropping branches – now I can stop throwing them over the fence into the woods! Love this! Can’t wait to give it a whirl after all the Thanksgiving madness has passed. Thanks for sharing! Honestly I wish I could create snow branches but unfortunately I get the real deal smh!! Cute idea though! Oh my word – I can’t wait to go out and find sticks in the morning! Thanks for sharing!! Simple and pretty. Epsom salts are cheaper than glitter and, hey, you can’t soak sore feet in a bowl of hot water and glitter. (well, you can…but..) Thank you for sharing. Love these. Fantastic idea. Pinned, tweeted and stumbled! Very Pretty! I have branches planned this season too! I like how you combined both the salt & the glitter. Hopping over from your feature on A to Z!! I love this. I just pinned a cool ornament tutorial that uses Epsom salt…..what a great supply for our craft stashes! I absolutely love this idea!!! I’m a big fan of using branches to decorate for holidays, and this is perfect for the whole winter! So pretty – thanks for sharing how to make them. Another great idea! Beautiful job! You come up with the most clever ideas! I’m def doing this one. BRILLIANT! You’ve hit another home run. I can’t wait to try this. Love it! This is now today’s project. Thanks, Viv! Hey Viv! I gave them a shot (just posted) but my epsom salts were really old so more granular than salt-like. Not to mention I sprayed my branches silver first. But I still love them. Elaine, you can get epsom salt at almost any drug store or grocery store. what a beautiful idea! I love them! Great idea! Thanks for sharing. I’ve got some branches I used for Thanksgiving that would be perfect for this. I wanted branches like these for my tree but didn’t want to dish out the cash. I ended up spray painting with white and glitter paint but they were missing something. I am going to take them down and add Epsom salt. Exactly that extra bling I was looking for!!! Thanks!!! Awesome project! Thanks for posting. Well, let’s see, I have cheap-o white spray paint so I’m almost there-right?! 😉 I’ve never used spray adhesive. What a great product idea. I came here via Keren’s Free Pretty Things for You. I have done this myself a few years ago,used styrofoam block, covered it, stuck in my branches,added some artifical red berry branches and stuck a cardinal or 2 on the branches and made a pretty center piece for my dining room table. The styrofoam block I put on kinda flat platter, added some battery operated little twinkle lights and covered with some of that fake snow; kinda like that buffalo snow you can buy in package and made very pretty center peice on table. this is such a cool idea, thank you for the easy how-to!!! I host a weekly linky party, Inspire Me Fridays…would love you to share this or ANY of your awesome ideas!!! Have you ever tried to do this on a fake evergreen tree? I have small ones that are just plain green that I would love to spruce up. Thanks! What a great idea for using epsom salts! I have done the same thing with sticks, acrylic craft paint, mod podge and diamond dust that I bought at Michaels. It is just what I had at home. Never thought about using glitter! So Pretty!!!! LOVE THIS IDEA!! Thank you so much! Also, Do any of you know a safe and hypoallergenic way to frost your Christmas Tree DIY? I don’t want all those chemicals in my house…. It’s hard enough 90% of Christmas trees are sprayed with Pesticides before they enter your house and cause LOADS of allergies during the season. Any help ladies?!! Turned out great… I even used some branches we had with a few leaves… soo pretty… making for a winter wonderland party! You can use just about anything, but I like just plain sticks and branches the best. Th thanks so much for sharing this idea. I am so going to do this for Christmas this year!!!! This is such a great idea.. I so love it.. I’m doing a winter Wonderland theme party for someone and this is very inexpensive and creative and beautiful. Thanks for this info. Thank you! Even at halF off the Ones i bought were still expensive. I kept thi king! “There’s got to be a way to make thEse.” Epsom salt is brilliant! Can you spray with a clear sealant so thecsalt wont melt?